I do love fall. Even though it now causes issues with my asthma and allergies! Supplies: Stamps – Lawn Fawn, paper – Cosmo Cricket woodgrain, Neenah Classic Crest Solar White, Stampin’ Up! Crumb Cake, Crushed Curry, Old Olive, Pumpkin Pie, Really Rust (retired), Soft Sky, inks – Copic E23, VersaMark, VersaFine Onyx Black, dies – Lawn Fawn (chipmunk), My Favorite Things (leaves), Taylored Expressions (banner), embossing powders – Filigree Fine Art Powder clear, Stampin’ Up! Classy Copper. 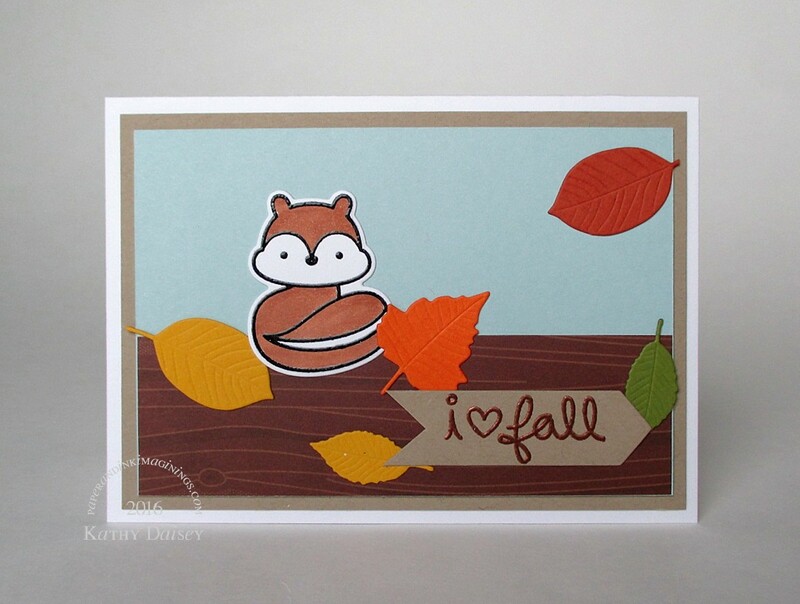 Categories: card, note | Tags: card, Copics, Lawn Fawn, Neenah, Papertrey Ink, Stampin' Up!, Taylored Expressions, Tsukineko, VersaFine, VersaMark | Permalink. I wish we had chipmunks – they are so, so cute! Adorable card and season appropriate! Hope you aren’t suffering too much. Yes, chipmunks are adorable. Allergies & asthma have been nagging this week (maybe 4 out of 10 on the scale)…not horrible, certainly functioning through. Leaves are starting to fall, and then symptoms will escalate. Poor you. Stay indoors, make lots of super and lovely things! Maybe cupcake icing would help soothe you?! You are too funny, Gillian! I hadn’t thought about cupcake icing and its medicinal benefits…maybe I should work on that. 😉 I think I am making buttermilk biscuits (Southern US thing. not UK biscuits) with dinner, maybe they will help, too. Inhaling flour as I knead the dough can only help my lungs! I have heard of them and wondered what they are like. I am guessing maybe like a savoury scone, or a baked version of a dumpling perhaps. Don’t think flour inhalation is recommended in even the most fringe of alternative therapies! Buttermilk biscuits are definitely a cross between a baked dumpling and a scone! I was careful with the flour, no coughing ensued! Jolly good. Wouldn’t want you to have a flour-induced emergency situation!